Classic American Summer Camp experience. We’ve been running Summer Camps since 1951, and we aim to offer the same simple, social, transformative environment we always have. Campers enjoy spending a week at our beautiful facility living in the woods, trying new things and they depart with new friends, increased self-confidence, and memories that will last a lifetime. We’ve found six days jam packed with non-stop fun, activities, and cabin life to be the perfect amount of time to spend at Summer Camp. Some come for one session, some come for a few spread out over the summer, and some come for several weeks in a row. 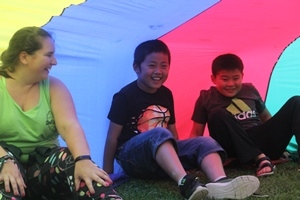 We believe every child should get a chance to spend a week at Summer Camp, and to help achieve this we try to keep our fees as low as possible. A cornerstone of our Camp program is that we are a completely unplugged, tech free environment. For both campers and staff, there are no phones, tablets, computers, or screens of any kind. 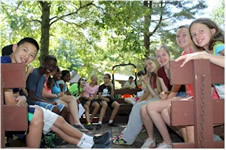 This allows our campers to focus on the lost art of connecting person to person during perhaps the only week of the entire year they won’t come into contact with a screen. We invite campers to discover what can happen when an entire community strives to simply be nice to each other, and treat themselves, each other, and everything they come into contact with the two golden rules of Camp. Once a camper has spent time here, they become an important and permanent member of our Camp family. We have a return rate of over 70%, meaning that many of our campers come back summer after summer all through their youth. In fact, over half of our counselor staff have been campers here themselves. Our campers love summer camp. See what people say about us.